You could be an expat who’s only heard horror stories about Delhi, a new university student who’s both eager and confused on how to get settled in, a employee on a budget dealing with a new job and a new city both at the same time, or an entire family moving here together, we’re welcoming you to the city with zero cuss words, a lot of momos and a few tips that’ll help you become a local in no time. Download the Delhi Metro map, Ola and Uber— these three guys will your new best friends. The Metro’s efficient, well connected and really convenient. Taking a cab all the time may be a pricey affair, so you can choose to take an auto. Beware, though—they’ll try to rip you off regardless of where you’re from. If you happen to run into one who’s ready to use the meter, you’ve just witnessed something miraculous. Also, cabs can cancel on you, especially if you wish to travel to Noida or Gurgaon (because of license issues). Always call and confirm first. If it’s raining, prep for multiple cancellations, rejections and surges in pricing by autowallahs and cabs alike. PS. Buy a metro pass instead of the token. It’ll make your life easier. The one aspect of Delhi you'll probably love is the city's food culture. The street food is to die for (expats, watch out for Delhi belly and never ever drink tap water). Chaat, paranthas, butter chicken, chhole bhature and more such dishes have got to be on your must-have list. But the one thing that you’ll most likely get addicted to is momos. If you’re hungry and lost, there’ll probably be a momowala somewhere near you. 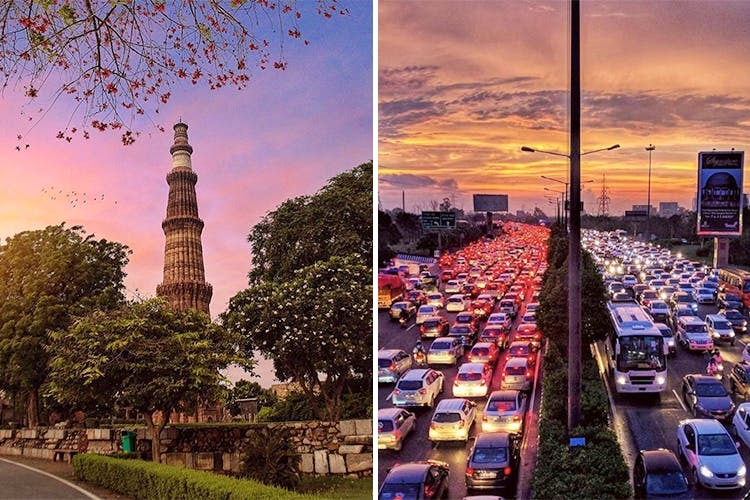 Delhiites can curse (we know you’ve heard about this before). Getting used to that will take some time. So, try to not get offended too quickly. Moreover, they can be pretty loud. If you come from a place where people speak politely and softly, prepare yourselves for the avalanche of MCs, BCs and loud conversations that you wish you couldn’t hear. Bargaining is a necessary art, and one that everyone can learn. Our city’s a hub of amazing street markets (yes, there’s more than just Sarojini Nagar) but no street shop will ever quote the right price in the first go. We suggest that you watch and observe the locals around you do it before you try it yourself. Meanwhile, you can always head to these great malls. No, we’re not talking about birth control. Before you move, make sure you’ve done your research about your locality, including the nearby markets, hospitals, police station, travel time from your workplace (the shorter, the better—traffic can be killer during rush hours) and if it’s in the suburbs or an industrial area. South and Central Delhi are relatively safer and better developed than other areas. Avoid going alone to any isolated or badly-lit places, especially if it’s late. Always have your phone on you. Don’t freak out if people are staring (they will, don’t even try to figure out why). And most of all, trust your instinct. Whatever the season, know that it’ll be extreme. Summers can get downright unbearable, especially with the loo (we’re talking about the wind here). If you’re from a warm region, winter will keep you shivering non-stop. Make sure you’ve stocked up well on separate wardrobes for both these seasons. If you’re out at night, it may feel like the city's dead. Trust us, it’s not. We’ve listed some of the best bars here. Party lovers, you can head to any of these nightclubs. If you’re in Gurgaon, you can also BYOB and head to these ahaatas. Take note - thekas or Wine And Beer shops are open from 10am to 10pm. If your idea of late-night chilling is going on long drives and stopping for some roadside bingeing, save this list of dhaba-style places for future reference. Lazy bums, these light night food delivery services will save your life. For a city so green, the city’s pollution levels will astound you. Buy a mask (the smart masks, not the flimsy surgical ones) from the nearest chemist just in case your lungs aren’t taking well to the new air. October and early November are particularly trying times. Depending on the area you’re in, power failures and water shortages can be incredibly annoying especially during summer and rainy season. Keep an eye on local news to know if any water shortage is expected. For power cuts, you can call these helplines on 01139999707 or 01139999708 to lodge a complaint or know when to expect it back (keep your CA number handy if you can—you'll need it to register a complaint. Need help settling in? Check out these apps (they include rent assistance / home cooks/ rental services for furniture and appliances and more). If you’ve got no time to cook your own meals, here’s a list of dabba services in Delhi and in Noida. Broke your phone or laptop that needs to be repaired? Hit up Nehru Place market or Gaffar market. If you’re looking for home services for anything at all—spas, AC repairs, deep cleaning, interiors, furnishings etc, Download the Urbanclap app or check out their website. And finally, overwhelmed by all the newness and in need of an escape? These places will be your refuge.